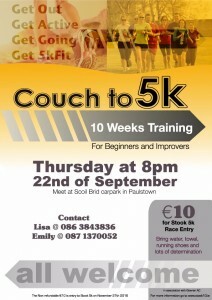 Building on the success of previous years, we are continuing with our “couch to 5k” programme to prepare for the Stook 5k dash! 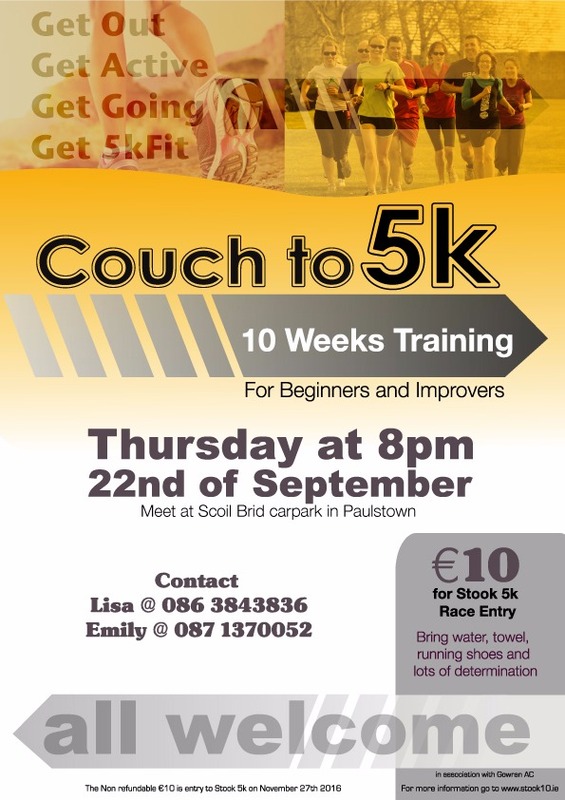 This year we will be meeting on Thursday nights at 8pm at Scoil Bríd carpark in Paulstown, beginning on 22nd September. All are welcome – beginners, improvers and those looking to “un-hang” those runners that sometimes get mysteriously mislaid during busy times! We have a variety of Gowran AC members who are leading this programme, and will provide plenty of support and encouragement. Just bring yourself, water, runners and a generous dose of enthusiasm! We all started our running somewhere and what better way to begin than to join in with a group of lively ladies and gents….while getting fit in the process! One thing is for sure, you’ll be faster than those at home on the couch! The sweetest part of all will be crossing that finish line in Dungarvan village, cheered on by your new running buddies! The post-race refreshments are literally the icing on the cake!